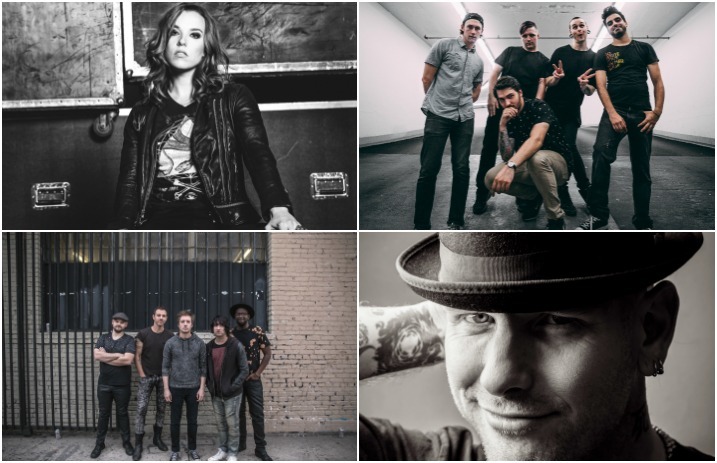 With the big night right around the corner, the 2017 Journeys Alternative Press Music Awards are thrilled to announce even more performances and special guests appearing at this year’s main event. The show will feature a special one-time performance billed as PUNK GOES POP LIVE!, spotlighting surprise performances from various artists featured on Fearless Records’ Punk Goes Pop Vol. 7. The album will be released July 14; digital and physical pre-orders are available here. In celebration of this special performance, Fearless Records is giving one winner and a friend a chance to win a flyaway for two to the APMAs, a one-year subscription to Alternative Press and an Amazon Echo (grand prize valued at $3,500). You can submit your entry here before July 2 for a chance to win. Also joining this year’s diverse assortment of APMAs performers are GRAMMY® nominated rock band Plain White T’s playing a stripped-down rendition of their platinum-selling hit “Hey There Delilah,” and hard rock heavyweights Nothing More. Alternative music’s biggest night will also feature a special guest performance from dynamic frontwoman Lzzy Hale of furious rockers Halestorm. In addition, more special guests have been announced! Viewers can expect to see appearances from: Patty Walters of As It Is, Attila, Avatar, Ollie Baxxter of Broadside, Chad I Ginsburg of CKY, Creeper, Dance Gavin Dance, Grayscale, Hands Like Houses, I Prevail, I See Stars, Jeffree Star, Juliet Simms, LIGHTS, Lynn Gunn, SWMRS, State Champs, Corey Taylor of Slipknot/Stone Sour, Sleep On It, members of Sum 41, William Control and Dan “Soupy” Campbell of the Wonder Years. To be a part of history at the APMAs, get your tickets here! Tickets are available now, with a limited number of VIP packages remaining. In honor of their 32nd birthday, AP has discounted tickets available for the APMAs, but for a limited time only. As our special gift to fans, these low prices will be offered throughout the rest of the month and start at just $15. There are less than 10 days left to cast your vote for your favorite artists, so be sure to make your voice heard here. Read more: QUIZ: Which 2017 APMAs Album of the Year nominee are you? Watch the APMAs site for more details on performers, presenters, red carpet appearances, surrounding events and more. Previous articleQUIZ: Which music festival are you? Next articleQUIZ: Which ‘Limitless’ Jenna McDougall look are you?